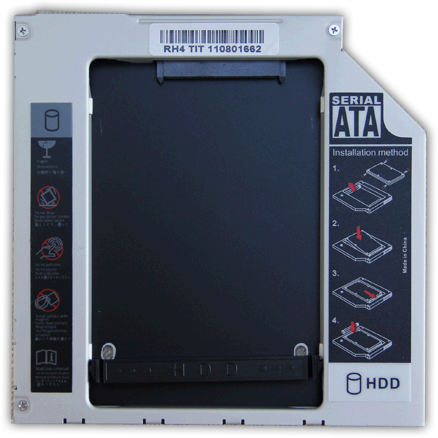 A while ago I replaced the harddisk in my Mid 2010 15″ MacBook Pro with a nice 160Gb Intel SSD. However, having both MacOS X and Bootcamp with Windows 7 installed – as you can guess – makes 160Gb eventually rather small. But getting one of those much bigger SSD’s is kind-a painful for my wallet, specially since I had a similar 160Gb Intel SSD spare laying around (long story). But how do I get 2 harddisks in my MacBook Pro? Fitting a second harddisk …? The first problem I ran into was physical space. 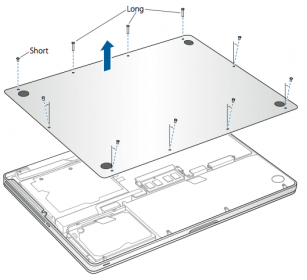 It’s a laptop and as usual, a laptop does not have spare space, let alone for a 2.5″ drive. 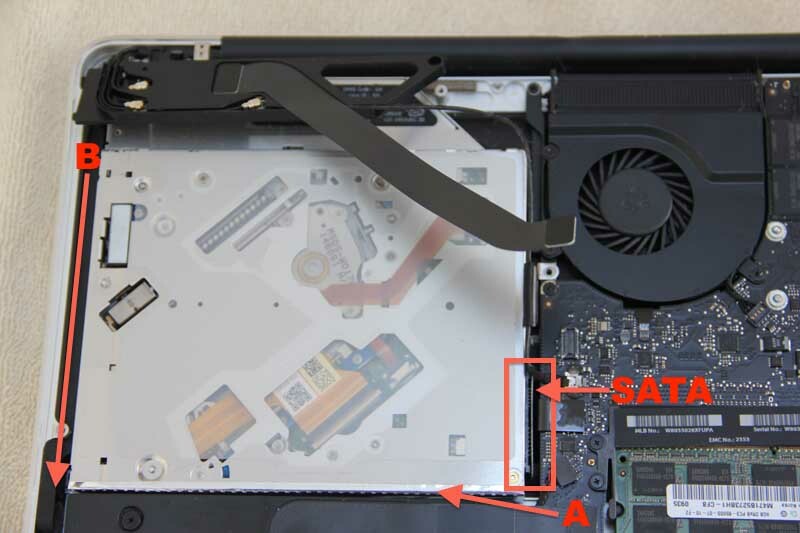 The second problem is that, unlike a desktop main-board, laptop main-boards do not have an abundance of SATA connectors either. So how can we resolve these 2 issues? 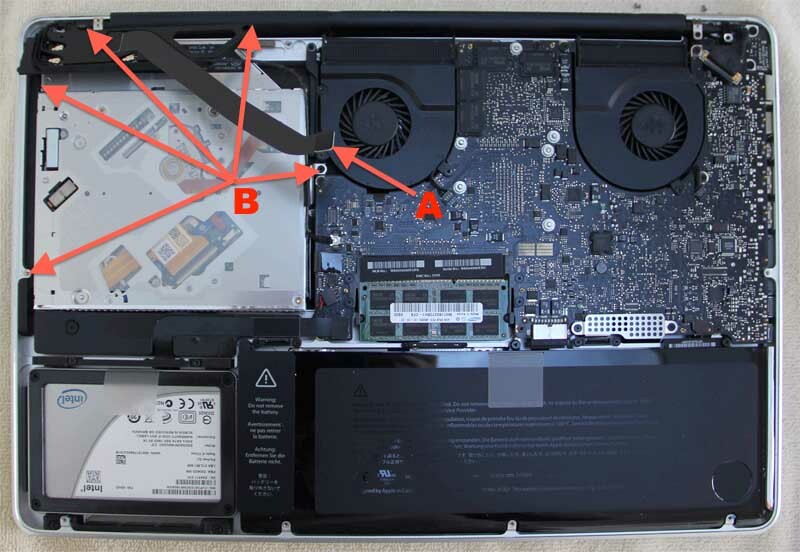 To go this route, you will need an adapter to make a 2.5″ harddisk fit the optical drive bay, I did find one on Amazon . The choice of drive is completely up to you. I really like speed, so I went with another 160Gb Intel SSD (probably not for everybody’s budget), but if you’re planning to just use it for massive storage then a regular 2.5″ harddrive as well offering more storage capacity at a much lower price. Note that when you’re using two identical (size) drives then you could consider a RAID-0 setup which will be wicked fast, specially when using SSD drives. Read this article for more details on how to get RAID-0 going in a setup like this – be aware though that although wicked fast, if one disk fails: all your data will be gone … (RAID-0 writes data split to both disks – which makes it so fast). One harddrive adapter for an optical bay (I used this one from Amazon) as displayed earlier. A 2.5″ harddrive or SSD drive. I absolutely LOVE Apple hardware, not just for the look, more so for the art of how they build their hardware. Removing the optical isn’t difficult but requires finesse. First gently disconnect the flat-cable marked A in the picture below by gently lifting it – you’ll notice it pop out of it’s socket without the need for any force. You only need to disconnect one side – the end that is closest to the fan (where the arrow is pointing to). Once disconnected remove the screws indicated by the B arrows. You’ll notice that you can no gently lift the black plastic piece where the cable go to. Don’t force it, don’t try to completely remove it (it’s not needed). Once the screws have been removed you can slowly lift the optical drive, start by gently lifting the lower side up (in the picture blow; indicated with arrow A). Once you lifted it a little bit, you can disconnect the SATA connector and gently slide the entire drive out in the direction indicated by arrow B. Next we have to place the harddrive or SSD drive in the adapter, which is pretty straight forward. Don’t forget the black plastic part to “lock” the drive in, and the 2 screws at the bottom to secure the drive as much as we can. 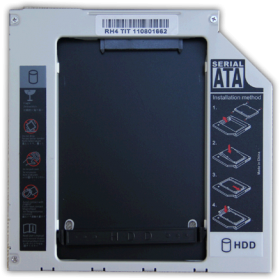 Once the disk is mounted in the adapter, slide the adapter in the place where the original optical drive was located by sliding it in in the reverse order – don’t forget to connect the SATA cable while placing the adapter. Also not that you’ll have only one screw to mount the adapter (the missing metal piece). After placing the drive I noticed a little wiggle space so I shoved some plastic (I actually rolled up the little zip-lock bag in which the screws from the adapter came) next to the adapter to make it fit snug, as shown below. Yeah, I know, it’s maybe half-assed, but it works. Now you have to place the black plastic (top) back and reconnect the black flat cable (gently place it on the connector and gently push it on it until you feel a gently click). 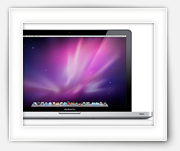 After that – and verifying that you didn’t forget anything – time to put the back of the MacBook Pro. Remember the long and short screws we found when we took the back off (take a look at the image in the beginning of this article). Well, now it’s time for a first boot with your new disk drive … you might need the Disk Utility (Applications → Utilities → Disk Utility) to partition and format your drive … and that’s all there is to it. Next you can start moving stuff to the new drive, for example your download folder, or your virtual machines (if you use VMWare Fusion or Parallel’s Desktop ), or your photo/movie/music collection, or even move your BootCamp over to the second drive. The original optical drive … well you can store it or consider finding an enclosure so you can still use it as an external USB drive. I did the same, and put in a 1 Tb drive on the optical SATA position. However I cannot seem to backup the drive now to a USB drive. It gets about 5 Gb done then just stops the copying process. I have to reboot to get copying again. Very frustrating. That must be frustrating indeed – it could be that the 1Tb drive is pulling to much power (mA) for the computer to keep up. Would you be able to use a smaller drive for testing purposes?